Hi Gypsy Soul Laser Cuts peeps. How's your Summer going? 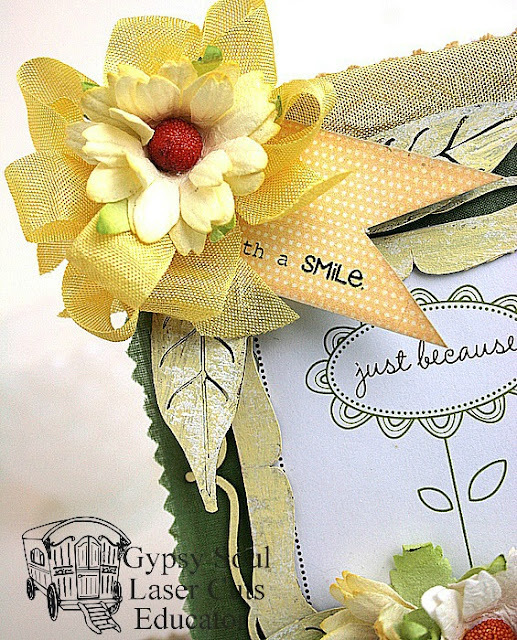 I have a cute sunshiney yellow card to share today. I first painted my chipboard pieces with yellow chalk paint. When I know I am gonna get the hands dirty I will paint other pieces so they are ready for future projects. 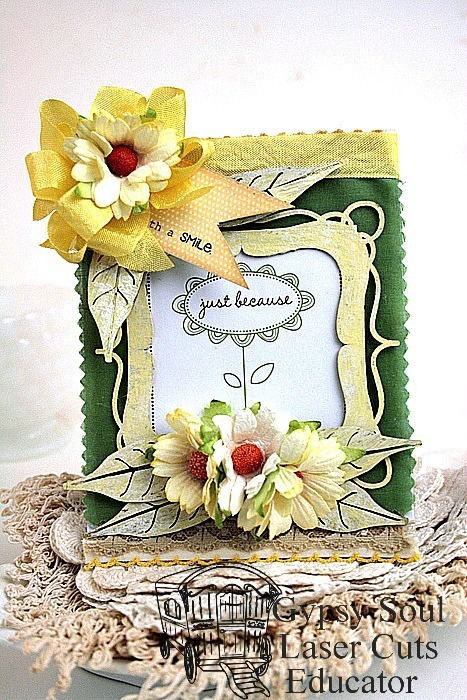 In this project I used the leaves and frame. Next I covered my card stock with some fabric scraps, my sentiment, and ribbons. 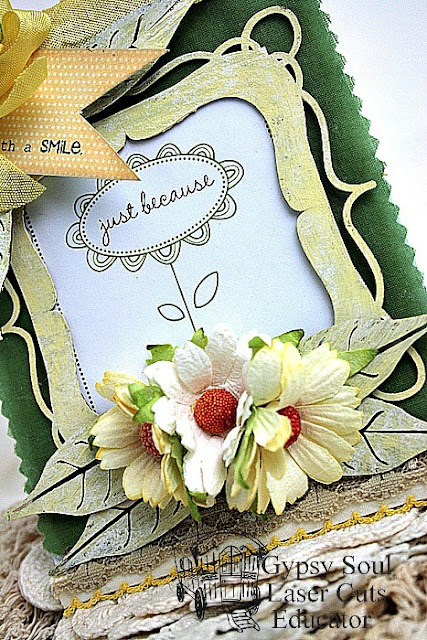 From there I added my florals and my other sentiment and was done! Hi there folks! 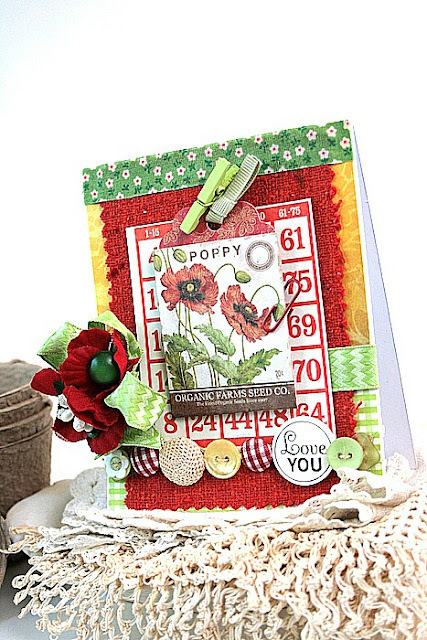 Cherry here today to share a sweet happy card. I just can not get enough yellow this year! I used the Coved Rectangle classic stackers to create the shape of my card. Hi guys, Cherry here to share a card made for the Cheery Lynn Blog today. I have a sweet pink shabby card to share. I made it a thank you card but it could be any type of card you like. 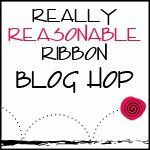 Today there is a new challenge up at the RRR blog. 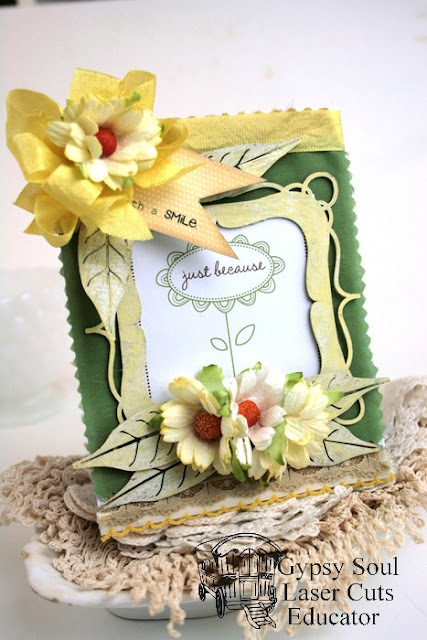 It is a Summer theme with ribbon challenge. Hope you can play. Here is my card. All about the red, white, and blue! I used both red seam binding and a patriotic grosgrain at the bottom. I also used several gorgeous blooms tucked into my bow including royal blue open roses, mixed color chrysanthemums , and aqua/blue Cosmo mix. Hi folks my day over at the RRR blog and also the Cheery Lynn Blog. Hello there creative peeps! It is my day over at the Gypsy Soul Laser Cuts Blog. 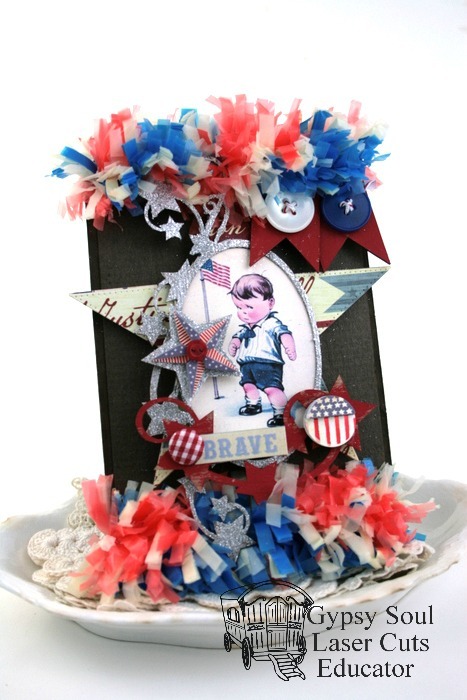 I have a fun Patriotic project for you using an antique photo sleeve. I started by added some stitched patriotic fringe on the bottom and top of my project. I than got to work painted my chipboard pieces silver and reds and than glittering the silver pieces with glitter so they were ready to use. 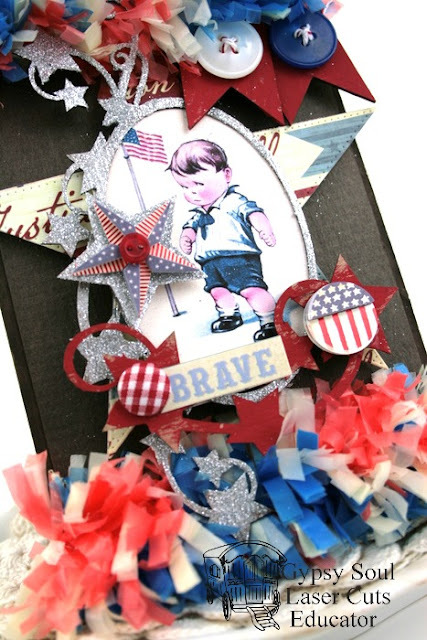 Next layer a diecut star to the back and layer them with your image and frame the image with your glittered star frame from the Stars and Flourishes border and corners set. 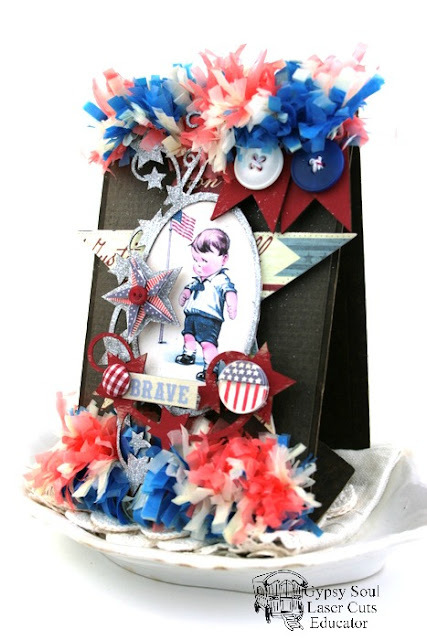 I than added a few scrap pieces from the Banner Border strips set . I painted them red and added them to the top right corner of my project for detail. From here I kept adding stars for a dimensional look. I also added some patriotic stickers, sentiment, and a cute gingham button. Well that is it for me!! Thank you so much for visiting the GSLC Blog today! Hey folks time for a RRR blog hop! 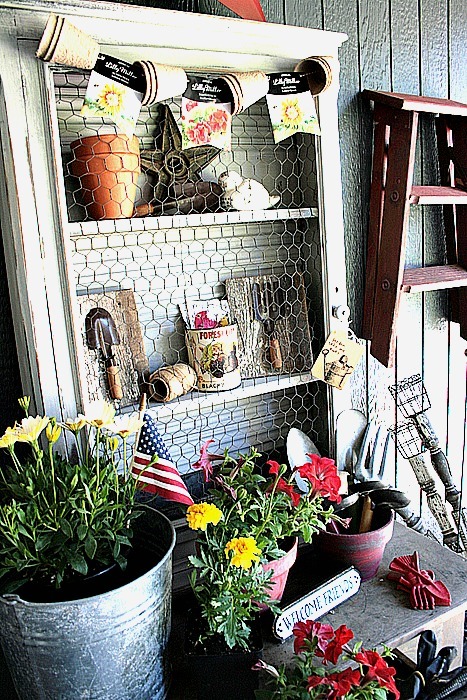 You should have found your way here from Kathy's lovely blog. If at anytime you find yourself lost...just start back at the blog link above. Here are the lovely ribbons. Beautiful soft shabby colors! I created two sweet mini envelopes with some simple tags tucked inside. I also used Lace Blue seam binding, Baby Blue Cherry Blossoms, White Berry Clusters, and Mixed Blue tone trellis roses. Hi guys I have a fun card for you today made for RRR. Just a good ole Summer time card. I used red seam binding and broke it up with a gorgeous flori pastel Anemone. I mixed in some vintage polka dot ruffle trim I found in my stash for a perfect Granny chic touch. I used a fun chipboard frame from Gypsy Soul Laser Cuts to frame out my bicycle. I painted it red and used a white chalk paint pen to add some distressing. Happy mid week! 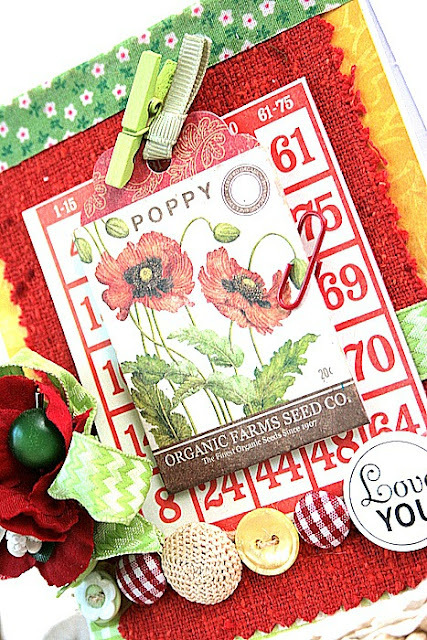 My day over at the Cheery Lynn Blog today. I started with some scrap papers and added my ribbon. I used the 3d Rose 1 die twice to create my background along with the Sakura Flower die . 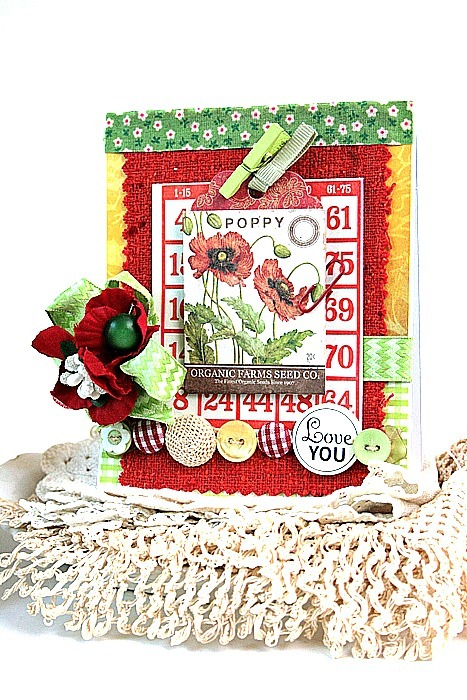 I than layered my bird image on top along with some buttons and my hello sentiment from the Bohemian collection. 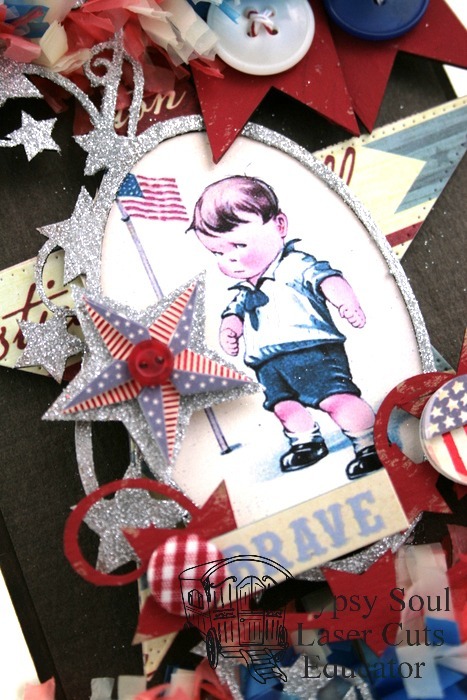 For a little added detail I also used a diecut from the Patriotic Swag die set. Hi friends. My day over at the RRR. The weather has finally turned towards some consistent sunshine and I have been out planting some flowers. Thought I would share some fun photos of my new gardening cabinet I up cycled and this banner I created using Cherry Twine from the RRR store to pretty it up. 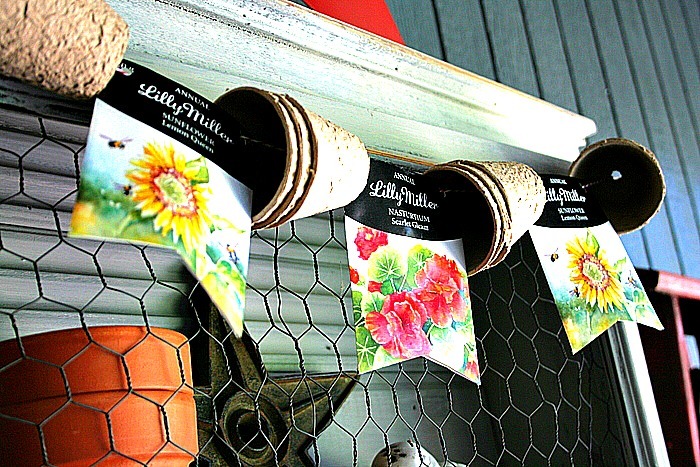 Ribbons come in handy for decorating as well. I simply recycled some seed packets and added some stacked mini peat pots to some twine. 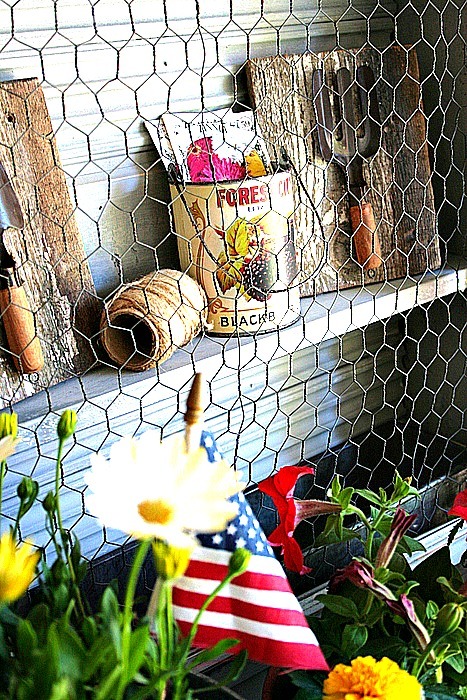 It added some color to my gardening cabinet. It was so fun breaking out the power tools and getting dirty! I added left over shiplap, fluted molding, and shelves to the inside and than added some old chicken wire to the door. Oh and because I can't leave with out sharing a card...here is one with a gardening theme of course.